Home » Miniscule or Minuscule – Which Spelling is Correct? English borrows many words from other languages, including Latin, French, and German. Sometimes, these words are borrowed wholesale, without any modification whatsoever, but other times they are anglicized so that they appear similar to other English words. In these cases, they are called loan words. Often, nuances of meaning are lost in translation. Minuscule is a loan word from Latin, where it was related to a word that meant rather small. English has several other words that mean rather small, including miniature, which starts with the prefix mini. Should we add miniscule to the list? In your reading adventures, you may have seen the word spelled both ways. Continue reading to find out which version you should use. What is the Difference Between Miniscule and Minuscule? In this post, I will compare miniscule vs. minuscule. I will use outline the correct spelling and use the word in several example that demonstrate its proper context. I will also show you a useful memory trick to help you when you are stuck choosing either miniscule or minuscule in your own writing. What does minuscule mean? Minuscule, so spelled, is an adjective that means very small. In the context of typography, it can also refer to lowercase letters. Most of the time, though, it is a synonym of words like tiny and infinitesimal. My paychecks at the burger joint were so minuscule that I quit to lead a life of crime. Some people mistakenly think that minuscule is spelled as miniscule, presumably based on the assumption that the word relates to the prefix –mini. That is not the case, however. In fact, minuscule derives from the word minus and has nothing to with –mini, hence the spelling minuscule. The misspelling miniscule has gained traction in recent years (see below), but minuscule continues to predominate in print and other sources as the standard spelling. What does miniscule mean? Miniscule is a misspelling of the word minuscule. As I mentioned above, minuscule is related to the word minus, but some have come to associate it with mini, an abbreviation of miniature. Thus, the U in minuscule is often replaced with an extra I. While not all spellcheckers flag miniscule as a misspelling, minuscule still predominates in edited prose, and style manuals such as The AP Stylebook and Chicago Manual of Style prescribe minuscule, as does The New York Times. The popular British usage guide Fowler’s also suggests that writers avoid the spelling miniscule. As you can see, miniscule has gained considerable traction since around 1940 or so. It still, however, fails short of minuscule by a margin of roughly 2:1. There’s no compelling reason to use miniscule in any context, and there is good company advising against it. Said company includes AP Style, Chicago Style, The New York Times Style, Garner’s Modern English Usage, and Fowler’s Dictionary of Modern English Usage. 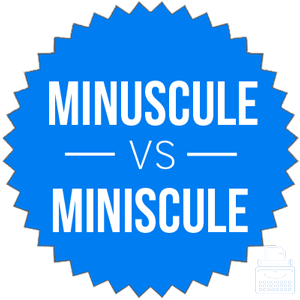 A helpful way to remember the correct spelling of minuscule is to think of the extra “i” in the misspelling miniscule as standing for incorrect, you can remember to always use minuscule in your writing. Is it minuscule or miniscule? Minuscule is an adjective that means very small. Miniscule is a nonstandard variant that still shows up in published writing from time to time. In general, stick with minuscule, since it is true to the word’s origins. Minuscule is the correct spelling. Miniscule is a misspelling of minuscule. 1 What is the Difference Between Miniscule and Minuscule? Leary or Leery – What’s the Correct Spelling?